Have you heard the quote “Do one thing every day that scares you?” It sits alongside so many other aphorisms designed to inspire us, to get us off our asses to act, to “Just Do It!” (thank you for the kick, Nike). Ten years ago I started a business. That in itself is a leap of faith; it exposes you to failure and requires that you gain the support of others, while drawing on every skill you have, including a few you didn’t know you had. I set out to create a strong, cohesive and appealing brand. 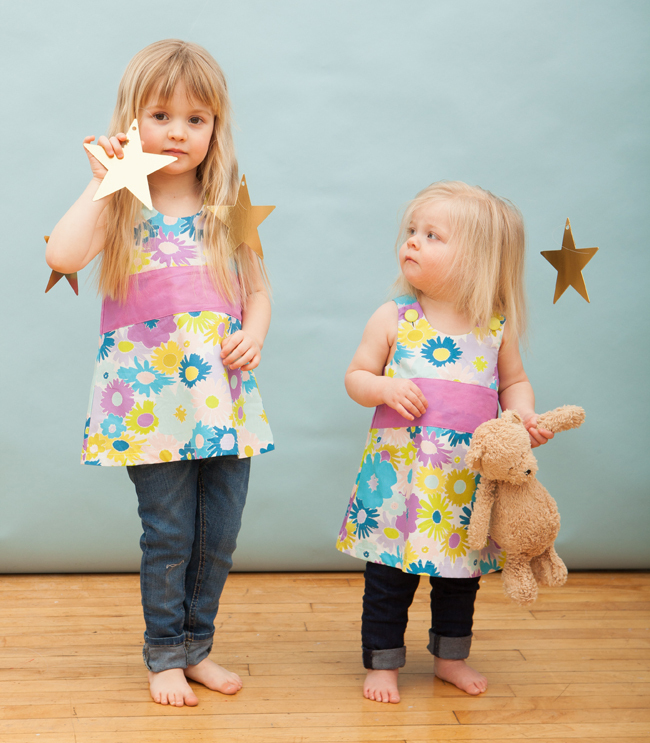 It worked — when I put my first children’s dresses out into the world, people liked them! Those people became customers, and then loyal customers. The line grew. Stores started to carry my clothing, both close to home and far away. And ten years later, I feel grateful to be able to continue to do this work for an appreciative audience. 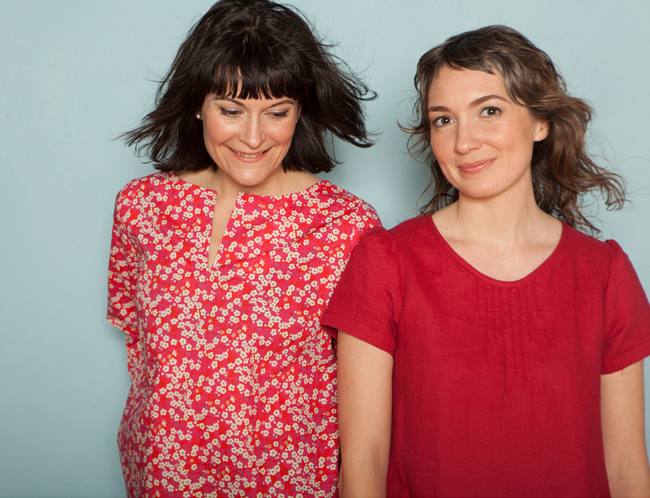 Over the years Red Thread has maintained its focus on vibrant prints and simple shapes. I love this fabric, and this Caterpillar Dress is cute, but do you really want this exact dress in your size? Really? Four months ago I decided that I was ready to take on the challenge of translating Red Thread into a line for women. I announced to many people who asked about it, and to many who didn’t, “My first women’s collection will launch in Spring 2015.” I said this out loud to as many people as I could, to give myself the courage to do it. Why did it take me so long to take the leap? Because it was scary! I love making clothing for children. But women’s bodies are more complicated, and most women are very selective about their clothing. What did that woman enthusiastically holding up a polka-dotted pink and orange dress really want me to make for her? The most tantalizing part of this new challenge was not how to go about making bigger clothing, of course, but rather how to translate the look and feel of Red Thread into garments suitable for grown-ups. How could I continue to use bold colour and vibrant prints in a way that would be really wearable? I’ve seen countless times that my young customers really love their dresses, enough to want to wear them all the time. Could I create that same feeling for women? The Audrey Blouse comes in several prints. I love this one! Here’s what I did — I asked my friends what they love most about their favourite clothes. I also asked my customers what they wanted me to make for them. I listened carefully. Then I chose my fabrics. Fabric always comes first for me. I found gorgeous, intensely-coloured linen, a few cotton prints that seemed to capture the Red Thread spirit but with a more mature flavour, and I decided to use the silky bamboo that I’ve used for my children’s tops for years (tops so soft, children want to sleep in them). Last but not least, I chose some Liberty of London prints, in a superfine cotton called Tana Lawn. They are shockingly expensive, but life is short. And since I felt excited about wearing these stunning fabrics, I guessed that you might like them too. The shapes vary; sometimes you want to wear a smart fitted dress that shows off your curves, and sometimes you want the comfort of a stretchy tunic over leggings. I love throwing on a vibrant blouse over a pair of jeans, so I made some of those too. I’m sure you’re not surprised to see some red! This photo features a vibrant Liberty-print blouse and a bell-shaped linen dress with pintucking detail at the neckline. My collection is ready, and I’ve been bursting at the seams to tell you about it. It will have its debut at the One of a Kind Spring Show in Toronto next week, March 25-29 (I’ll be in booth H-26, in the centre aisle). I can’t wait to see it on you. And I hope you find something in this first collection that you love as much as your daughter loves her caterpillar dress.